The 5790B AC Measurement Standard is a multi-purpose ac measurement and transfer standard designed for the most demanding calibration applications. It combines the accuracy you would expect from a thermal transfer standard with the ease of use of a digital multimeter. Absolute ac voltage measurement uncertainties are as low as ± 24 ppm (one year, 23 °C ± 5 °C). 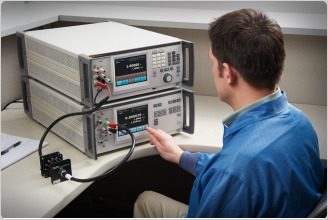 The 5790B is designed to meet the complete ac voltage, ac current and wideband verification requirements of the Fluke Calibration 5735A, 5720A, and 5700A Multifunction Calibrators; 5522A, 5502A, 5520A, and 5500A Multi-Product Calibrators; plus other calibrators, amplifiers like the 52120, 5725A and 5205A/5215A, and transfer standards and ac voltmeters. The 5790B covers an alternating voltage range of 600 μV to 1000 V, and a frequency range of 10 Hz to 1 MHz. Wideband voltage options extend frequency range to 30 or 50 MHz. The 5790B in combination with the Fluke A40B Current Shunts now allow you to make direct, absolute or relative current measurements without the need to perform any calculations. 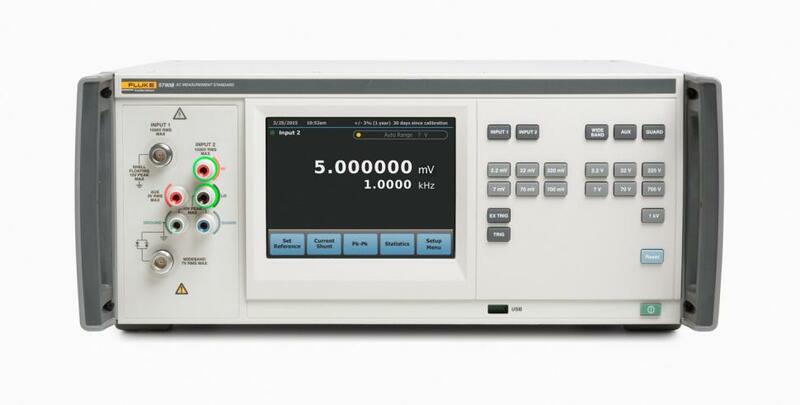 The 5790B may be used alone as a measurement device or as a transfer standard when compared to an external dc source. In either case the normally tedious switching and calculations are performed automatically by the 5790B, and the resulting ac/dc difference is displayed directly on the easy-to-read 6.5-inch full-color capacitive touch screen display. Since its release in 1990, the 5790A has developed an unmatched reputation of being the most precise ac measurement standard in the industry. The technology behind the 5790A and the patented Fluke RMS sensor has made it the measurement standard of choice for calibration laboratories around the world. The 5790B retains the innovative technical features of its predecessor and adds many new capabilities and functions which expand the capable workload and reliability of the product. The Fluke A40B series shunt resistors provide a very cost effective method to expand the 5790B’s functionality to measure absolute and relative ac current to calibrate an ac current source. The 5790B's new user interface allows you to input and save current shunts to its memory. Up to 150 shunts can be stored along with the shunts’ serial numbers, calibration constant values (24 ac/dc, five loading error points) and calibration dates. 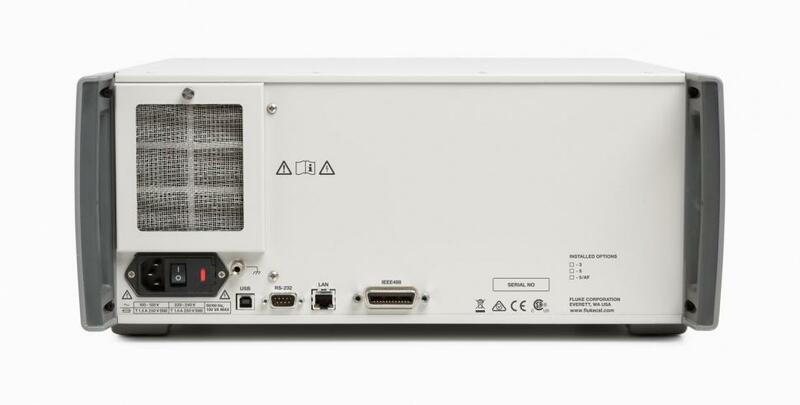 After the shunt information is loaded, the 5790B can be set up to take a direct absolute or relative ac current measurement within seconds by hooking up the shunt and simply selecting the appropriate shunt from the main menu. When using a current shunt, 5790B displays both the voltage and current measurements on the display along with the shunt information. Legacy Fluke A40 and A40A current shunts can be loaded and used to make relative current measurements. The “/3” wideband input and function, with ranges of 2.2 mV to 7 V, 10 Hz to 30 MHz, is retained from the 5790A model. A new “/5” wideband option extends the bandwidth even further, to 10 Hz to 50 MHz. The expanded wideband range extends the workload of the product to calibrate precision 50 MHz power reference outputs found on most RF power meters. A direct-readout-mode graphical user interface displays specifications for measuring common non-sinusoidal waveforms plus peak-to-peak computation (assumes THD <1 %.) This allows for instantaneous information when it is needed the most. Unlike the vacuum-fluorescent display on the 5790A, the new 6.5-inch capacitive touch screen display allows you to see more information on screen, reducing the need to switch between menus. The 5790B now specifies absolute dc voltage measurement uncertainties as low as ± 24 ppm (one year, 23 °C ± 5 °C), providing more confidence in transfer measurements. A dedicated special purpose 50 MHz, 225 mV, 50 ohm input function is available as an option for measuring RF power meter power reference outputs. The option is “spot calibrated” at the end of a precision level/phase stable metrology grade cable. It calculates the measured power with a 50 ohm load. Statistics showing number of samples, standard deviation, average, min and max are calculated using the displayed readings as the basis. As a benefit of the large touch screen display, the statistics data can be viewed while the main measurement is still visible on the screen. The 5790B now does peak-to- peak waveform calculations for you. You can select one of four waveforms: sine, square, triangle, and truncated. Some of these waveforms are difficult and time consuming to calculate. The 5790B performs all the calculations for you based on the measurement, significantly reducing time and possible errors. The graphical user interface features easy-to-read menus, as well as access to common functions with just the touch of a finger. Quickly select the range and input using the hard keys on the front panel. A bright red status indicator for HAZARDOUS VOLTAGE is located on front panel, letting you know immediately when hazardous voltage is present at the terminals. 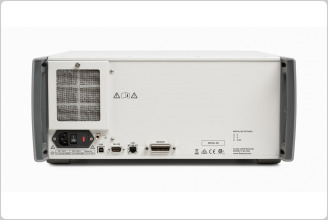 Like the new 5730A Multi- Product Calibrator, the front panel features Visual Connection Management™ terminals that light up to show you which terminals are active, guiding you to make the correct connections. The 5790B is based on the patented Fluke Solid-State Thermal RMS Sensor, which has been proven since 1979 in a variety of Fluke products like the 792A AC/ DC Transfer Standard. The Fluke RMS Sensor is a true thermal converter, not an electronic converter that calculates the RMS value. Because its output voltage is 2 V rather than the 7 mV to 10 mV of traditional thermocouples, the RMS sensor exhibits excellent signal-to-noise characteristics and minimal reversal errors. With a higher output voltage, more accurate measurements can be made. And because of its small size, the RMS sensor stabilizes quickly and operates over a wide temperature range. The 5790B also features hermetically sealed thin-film resistor networks to minimize ac measurement errors and enhance temperature coefficient. The RMS sensor and thin-film resistor networks are designed by Fluke to be rugged and reliable. Each is built to exacting standards by the Fluke Microelectronics Group to maintain quality and consistency part after part. The variety of inputs and connection types allows you to use the one that best suits your application. There are four sets of input terminals on the 5790B, two Type-N connectors and a set of five-way binding posts. One Type-N and one set of binding posts are dedicated to the ac measurement and transfer modes. 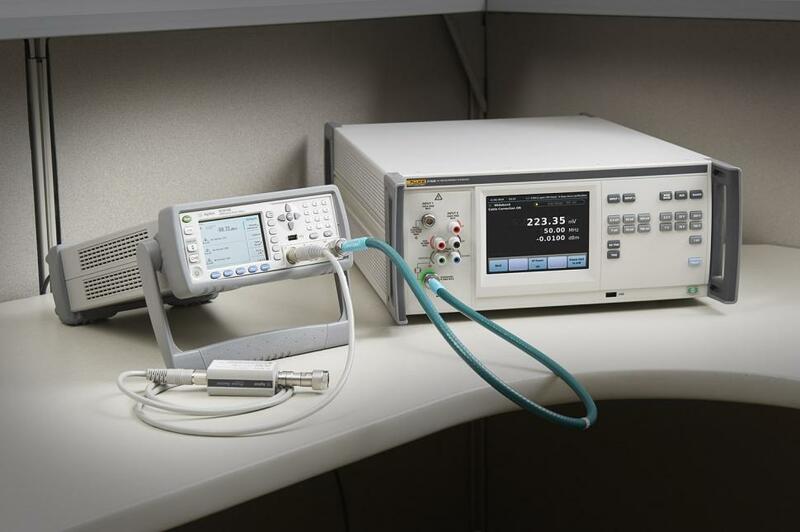 AC or dc voltages may be applied to either input connection over the 5790B’s full range, allowing you to perform automated ac/dc transfer measurements. The 5790B determines automatically whether the applied voltage is ac or dc. The second Type-N input connection supports the optional wideband mode. The input connection is easily selected with the touch of a key on the 5790B front panel. An LED indicates which terminals are active. Whether you are using the 5790B as a voltmeter or a transfer standard, input voltage and frequency are always indicated on the measurement display. In the transfer mode, the ac/dc or ac/ac difference is always indicated on the control display in ppm, %, volts or ratio. 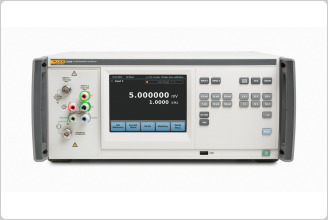 The 5790B is a fully autoranging instrument and it selects the best voltage range for the measurement you are making. You may also select and lock in ranges manually. Robust 1200 V input protection is active on all voltage ranges. 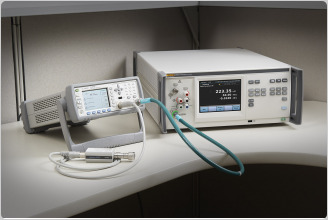 Using the trigger keys, the 5790B can switch from continuous to single measurements of the input voltage, making it easy to take sample readings at predetermined intervals. When using the 5790B in transfer mode, the reference voltage is stored, and all ac/dc or ac/ac difference measurements are made relative to it. You may also store the average of two voltages as a reference to eliminate dc reversal errors, for example. The intuitive front panel layout of the 5790B makes manual operation fast and simple. Keys and selections are logically arranged and labeled. And messages and menus are displayed clearly on the 5790B’s bright, touch screen display display. USB, GPIB/IEEE-488, Ethernet and RS-232 interfaces are included and all functions of the instruments can be controlled by a PC. Using an available instrument driver, the 5790B can be integrated into automated systems operating with MET/CAL® Calibration Software. The 5790B/AF has enhanced absolute accuracy to ± 0.23 % of voltage (1 year after factory calibration, 23 °C ± 3 °C, at 95 % confidence level) at 50 MHz and 223.61 mV, using a serialized one meter cable, characterized at that point for RF power meter 0 dBm reference output measurement. In the RF power measurement mode, the accuracy is specified to the end of the serialized cable with a curve fit for the other ranges and frequencies that is a first order correction for cable loss.